These are crimson flowered fava beans. The seeds were collected and sent to me by Dan. I planted them on March 17 - St Patrick's Day. I love the full roundness of the leaves. Prettier then regular favas it seems. I'm looking forward to the red flowers. I'm looking forward to the blooms. I am not familiar with this one. I can never think of fava's without thinking of a nice chianti...stupid scary movies ruin everything. ooo..show the blooms please when they flower. Sounds pretty. i've been following your blog for a few weeks - thanks for keeping such a helpful journal, your posts are wonderful. i just moved to woburn and have started a small backyard garden. have you ever had problems with ants/aphids on your fava seedlings? i just noticed each of my seedlings has 3-4 ants on it. what to do? I was worried I planted mine too late, but they are about the same size so hopefully fine. Are you going to grow them on a structure? Fava beans are very susceptible to aphids, which attract ants. If the conditions aren't good and the plants aren't healthy you will get aphids. It took me a few tries to get a crop of fava beans with out aphids. First, they need to grow in cool weather. Plant then as early as you can and hope it doesn't get too hot too soon. Second, I have had good success with adding broad bean inoculant. Third, they seem to need lots of sun. I had then in a partly shady spot the first time and they did not survive the aphids. I do not recommend any pesticides for the aphids, because you'll just get some other bug. Try trans planting to another location, sprinkling inoculant on the roots or just wait and see what happens. Even my healthy fava plants will usually have a couple aphids here and there if I search. So yours may be fine. As the summer heats up, and the crop is finished the plants tend to get more aphids. But then its time for composting anyway. I just planted another batch of seeds today. I don't think its too late yet - but will be soon. Of course last year was cool enough here all summer and I probably could have planted anytime. Kathy, thanks so much for your thoughtful reply. 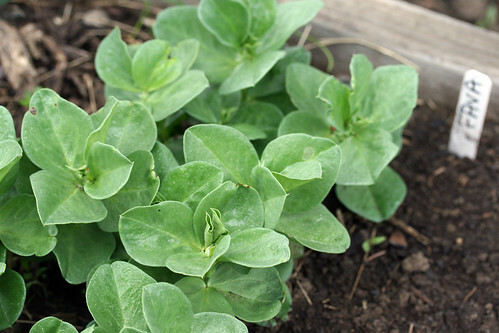 I'll follow your advice next season and plant them in a sunnier spot, my favas aren't in full sun until about 10:30am. I'm afraid I don't have another spot to move them to so I guess it's a waiting game at this point. I did read that ants and aphids can be washed off the plants with a strong blast from the hose, and that it will usually take care of the problem for a while because most of the aphids don't survive the deluge. I rinsed everything thoroughly (and pretty aggressively) a couple of days ago and haven't seen any signs of more ants or aphids, soooo... maybe success? Great! Rinsing off the bugs sounds like a very good solution.